Many of you know I’ve been working on an ARNKA challenge to eat healthier by cleaning out my frozen foods and storage crops in order to make way for the new crops and Meatball. I really enjoy being able to go down to my basement; pull out some frozen chicken, bell pepper strips, and diced onions; and throw it together to make a quick meal. Well, that got me thinking. Wouldn’t it be nice if everyone could do the same thing? I mean, we are all busy and could probably use some tips to help get dinner on the table quicker. Am I right? Plus if we preserve the produce when we have extra, we save money by not buying those items in the winter. 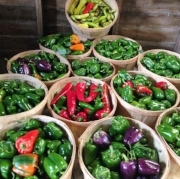 I had SO many peppers to freeze this summer!! So today I am sharing with you my 5 kitchen essentials to freezing your summer bounty (whether from our Farmstand or CSA or your own backyard garden). I’m sharing today, BEFORE you have all those delicious veggies, so you can prepare yourself in case you don’t already have these laying around your kitchen. Believe me, you don’t want to attempt freezing a bunch of produce without these 5 items! Plus, it gets us all dreaming of warmer weather and fresh, local veggies. YUM! 1. Large pot—A lot of produce needs to be blanched (put in boiling water for a short amount of time) before freezing. Having a large stock pot will allow you to work in bigger batches, cutting down on the time it takes to preserve your produce. Who doesn’t want that?! 2. Metal colander – Technically not needed, but I can’t imagine blanching produce without one. It makes getting the produce out of the boiling water easier and quicker. (Again, a great timesaver.) You just lift it out of the hot water and set it into cold water. All the veggies go in and out of the water at the same time for more even cooking. 3. Sheet pan with rim – After cooling the blanched veggies, I always lay them on a sheet pan to freeze quickly. Once frozen I transfer to freezer bags/containers (see #4). Freezing flat first allows me to break up the frozen chunks into smaller pieces. For example, instead of having to use a full, stuck-in-one-big-clump bag of green beans, I can pull out the amount we need for supper and put the rest of the bag back in the freezer. The same applies to produce that doesn’t need to be blanched. We slice peppers and dice onions, lay flat on a sheet pan, freeze, then transfer to bags, and place back into freezer. 4. Freezer containers – Once preserved, you will need something to hold your produce. Freezer bags come in a variety of sizes and fit into small spaces in your freezer. You can also use plastic containers, either recycled from deli meat or ones bought specifically for freezing. Sometimes the veggies get a bit of freezer burn if air is inside the containers so make sure you squeeze all the air out of the bags. A great alternative, although more expensive, is a vacuum sealer. We use one for almost all of our frozen produce, even mashed potatoes or pureed squash. Good-bye freezer burn and hello delicious veggies! 5. Food processor – Speaking of pureed squash, a food processor comes in handy when freezing produce. We use ours to make purees like squash, potatoes, and applesauce. The grater attachment is nice for veggies like zucchini and other summer squash. We even use the food processor to chop up hot peppers and onions; it will work for any veggie you want in very small pieces. I could use a chef’s knife to hand chop them, but you’ve probably seen a pattern with how I work: I like to make it as quick and easy as possible! 6. BONUS ITEM: A Freezer! :) That’s probably a given, huh? You never know…you might get so excited about preserving your produce in order to eat it throughout the winter, you need to go buy a chest freezer because the one in your fridge is too small! You might even end up like us with two deep freezers and still run out of space! If it sounds like too much work to grow all that produce yourself, but you still really want to have local produce during the winter (and the summer of course! ), consider joining our CSA. Our free choice CSA allows you to take only the produce you like. You can even take more than your family needs that week so you can freeze some for later. And don’t worry…we teach you how to freeze, can, or dry the veggies so you don’t have to figure that out on your own. But you DO have to have your own kitchen essentials. So what are you waiting for?